Merton’s Summer Reading Challenge 2013 has got off to a flying start with over 6,000 four to 11 year olds taking on the challenge to read six library books during the summer holidays. 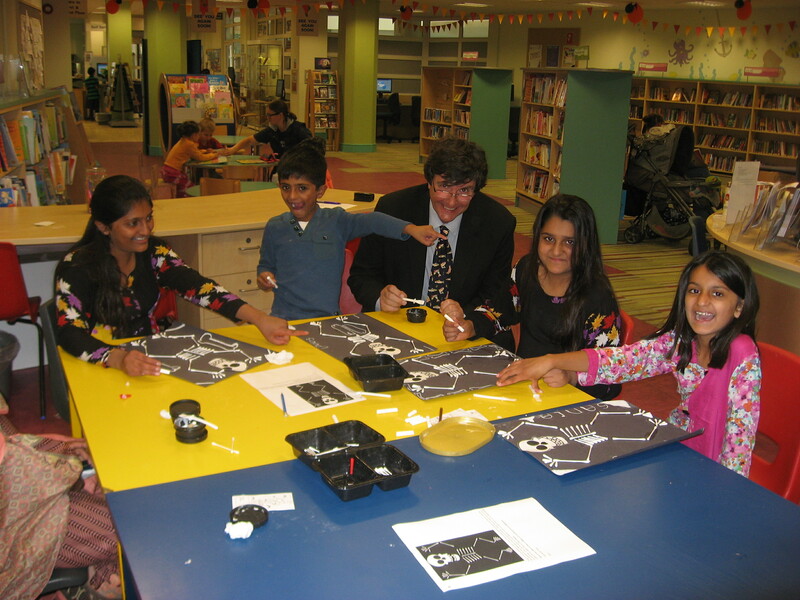 Children enjoying Six Book Challenge fun in Morden Library with cabinet member for community and culture Councillor Nick Draper. They’ve finished their six books, have you? Themed Creepy House, many of Merton’s young people are enjoying thrilling tales of ghosts and ghouls, and there is still time for anyone aged four to 11 to join in the summer reading fun. Six books should be read by 14 September. To be part of the challenge, all children have to do is go along to their local library with their library card. They will receive a special summer reading card which they fill in after each book they read, as well as posters, stickers and rewards along the way. When children finish the challenge they receive a certificate and a medal for their achievement. They are then automatically entered into a prize draw for a chance to win some fantastic prizes including £100 worth of store vouchers, an e-reader, £100, £30 and £20 toy store vouchers, cinema tickets and more.